Beverages namely organic coffee; coffee extracts, coffee substitutes; ground and whole bean coffee. Retail services specializing in the sale, importation, and distribution of beverages namely organic coffee, tea, cocoa; coffee extracts, coffee substitutes and juice; ground and whole bean coffee, cocoa, tea; accessories related to the preparation of serving of beverages namely coffee and tea pots, coffee brewing equipment; mugs, cups and saucers. Beverages namely tea, cocoa, and juice; accessories related to the preparation of serving of beverages namely coffee and tea pots, coffee brewing equipment; mugs, cups and saucers. 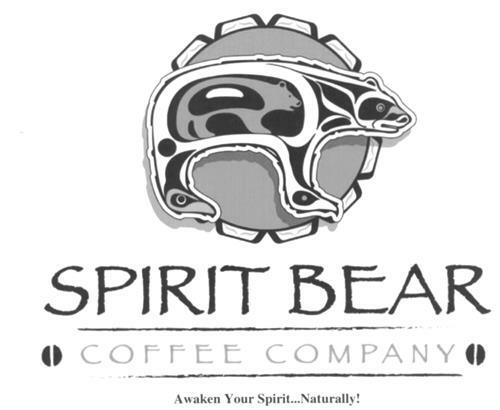 On Monday, November 17, 2008, a canadian trademark registration was filed for the above pictured logo by The Spirit Bear Coffee Company #6, 30 Chevigny Street, St. Albert, ALBERTA, CANADA T8N5A3. The Canadian IP office has given the trademark application number of 1419411. The current status of this trademark filing is Interruption of proceeding. The correspondent listed for is MILLER THOMSON LLP of Pacific Centre, 725 Granville Street, Suite 400, BRITISH COLUMBIA, CANADA V7Y1G5 The trademark is filed in the description of Beverages namely organic coffee; coffee extracts, coffee substitutes; ground and whole bean coffee. , Retail services specializing in the sale, importation, and distribution of beverages namely organic coffee, tea, cocoa; coffee extracts, coffee substitutes and juice; ground and whole bean coffee, cocoa, tea; accessories related to the preparation of serving of beverages namely coffee and tea pots, coffee brewing equipment; mugs, cups and saucers. , Beverages namely tea, cocoa, and juice; accessories related to the preparation of serving of beverages namely coffee and tea pots, coffee brewing equipment; mugs, cups and saucers. .
(3) Other sculptures -- Note: Including abstract sculptures. (1) - Beverages namely organic coffee; coffee extracts, coffee substitutes; ground and whole bean coffee. (2) - Retail services specializing in the sale, importation, and distribution of beverages namely organic coffee, tea, cocoa; coffee extracts, coffee substitutes and juice; ground and whole bean coffee, cocoa, tea; accessories related to the preparation of serving of beverages namely coffee and tea pots, coffee brewing equipment; mugs, cups and saucers. (3) - Beverages namely tea, cocoa, and juice; accessories related to the preparation of serving of beverages namely coffee and tea pots, coffee brewing equipment; mugs, cups and saucers.